Great things are happening in the Conservation Outreach section here at the DWR. One of the most exciting things I’m working on, as the new events coordinator for the agency, is the upcoming Western Hunting and Conservation Expo. Biologists will answer your questions about the 200 premium, limited-entry and once-in-a-lifetime hunting permits. The expo will be held at the Salt Palace in downtown Salt Lake City from Feb. 21–24, and let me be the first to say, you don’t want to miss it. We’ve been working hard with our partners, Sportsmen for Fish and Wildlife and the Mule Deer Foundation, to make it a great event for hunters and their families. DWR biologists will be on hand to answer questions about the 200 premium, limited-entry and once-in-a-lifetime hunting permits you can apply for. From turkey to bison, this is your chance to put your name in the hat for one of these unbelievable hunts! Our conservation officers will also be at the show to answer questions about poaching and wildlife law enforcement at the Help Stop Poaching trailer. 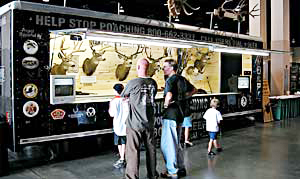 Conservation officers will be answering questions in the Help Stop Poaching trailer at the expo. In addition, DWR is participating in youth events at the expo. I can’t wait to see the kids as they navigate the activities we’ll set up for them. A group of schools has been invited to the Youth Wildlife Conservation Experience on Thursday, Feb. 21. 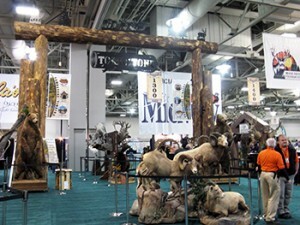 The event will showcase wildlife, hunting and conservation. Over 450 kids will have the opportunity to try hands-on activities like archery, air gun rifle ranges, habitat games and track and hide identification. They’ll have a chance to learn about outdoor safety, wildlife in Alaska and bear safety while camping. 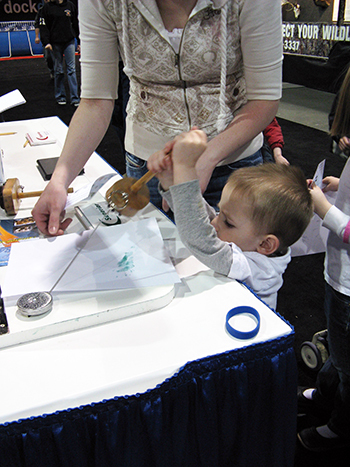 Archery and track-making are among the activities available to kids at the expo. If your school didn’t get an invitation to this exclusive event, don’t worry. Archery, air gun ranges and many other activities will be available for kids the remainder of the expo. Does your school participate in the National Archery in the Schools Program (NASP)? If so, your school’s team could be competing in the state tournament, which will take place during the expo. Over 28 schools will bring nearly 700 students from across the state to compete on Saturday, Feb. 23. We will have more than 60 volunteers helping run the range at the tournament and we couldn’t be more thrilled! As of May 2012, Utah had 44 schools trained and participating in NASP. If you’d like more details about this program, please check out the information page online. From seminars on elk hunting, bow hunting tactics and calling game to entertainment by The Oak Ridge Boys and Phil Vassar, this expo has something for everyone. So come out and enjoy the show. If you do, stop by and see me! I was very disapointed with the dwr this year at the show, we brought the kids, but where was the fun things for them to do ? no fly tying no owls or hawks, no bbgun shooting no tracks no fur no nature no nothing. theres more for them to do at scheels or cabeles. last year for me.